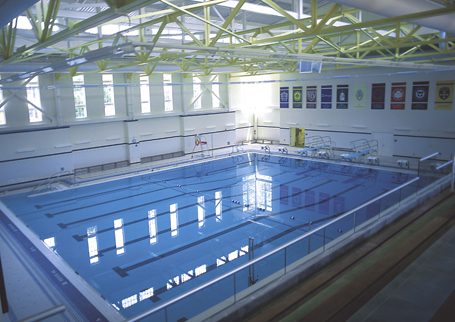 The new 70,000 square foot Sports and Fitness Center opened in the summer of 2003. This facility was designed to serve every girl at St. Catherines, from the junior kindergartener to the high school senior, from the artist to the athlete. The facility includes workout areas with weights and cardio- vascular machines in addition to an 8-lane 25 yard pool with one-meter diving, three basketball/volleyball courts, a jogging track, a sports medicine center, and a multi- purpose room for aerobics, kickboxing, yoga, or the latest fitness fad.